Alloy wheels are usually made from a combination of aluminum and steel, and keeping them clean is an important step to prevent corrosion. Simple cleaning solutions will work for regular maintenance or a deep clean. Once you're finished cleaning, apply a protective sealant so your wheels look good as new! 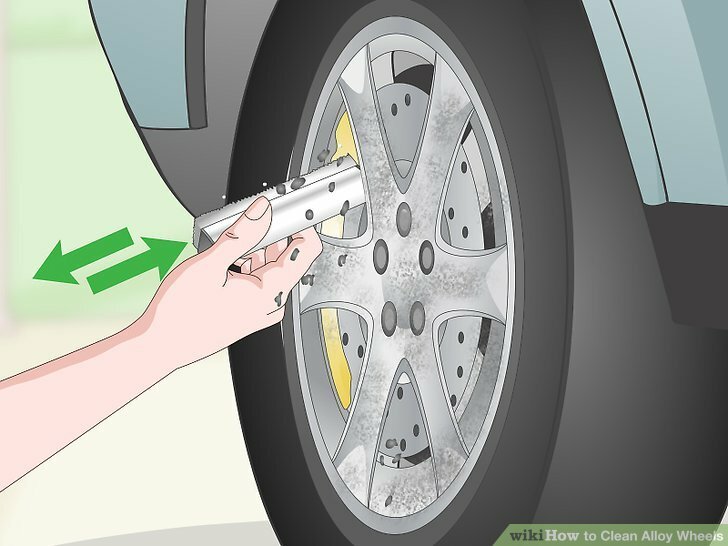 Spray the entire wheel with a hose to remove loose dirt. Work in an outdoor area on a cool, dry day. Use a hose attachment with a powerful stream to clear off any brake dust or stuck-on dirt. Spray all around the wheel, making sure the water gets to the inside of the wheels, or barrels. If you don’t have a hose attachment, put your thumb over the spout to make a concentrated stream. 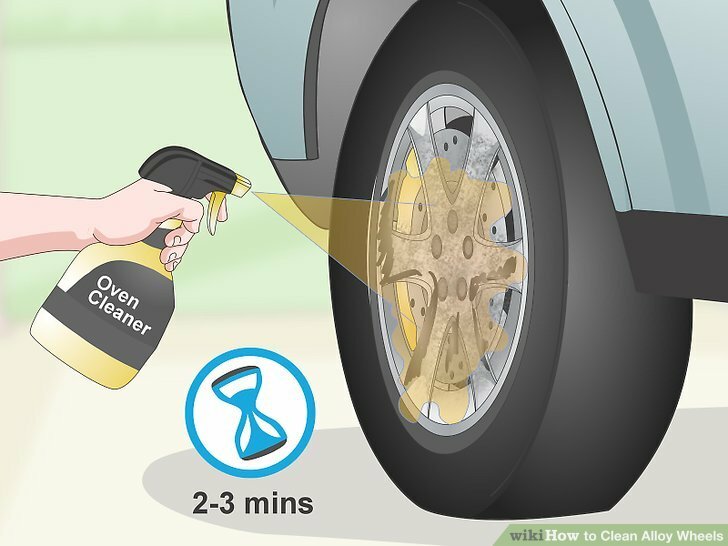 Apply a wheel cleaner onto the alloy rims. Find a cleaner that’s non-acidic and meant for alloy wheels. Use a spray bottle to apply the cleaner to the center hub and any spokes your wheel may have. Put more cleaner on any areas that have a lot of buildup. Let the cleaner set on the wheel for 1-2 minutes to let it penetrate the dirt and grime. Remove any plastic hub covers before applying the cleaner. Use distilled vinegar as a cleaner if you don’t want to use a chemical cleaner. Scrub the wheel gently with a soft-bristled detailing brush. Agitate the cleaner with your brush to lift the dirt off the alloy’s surface. 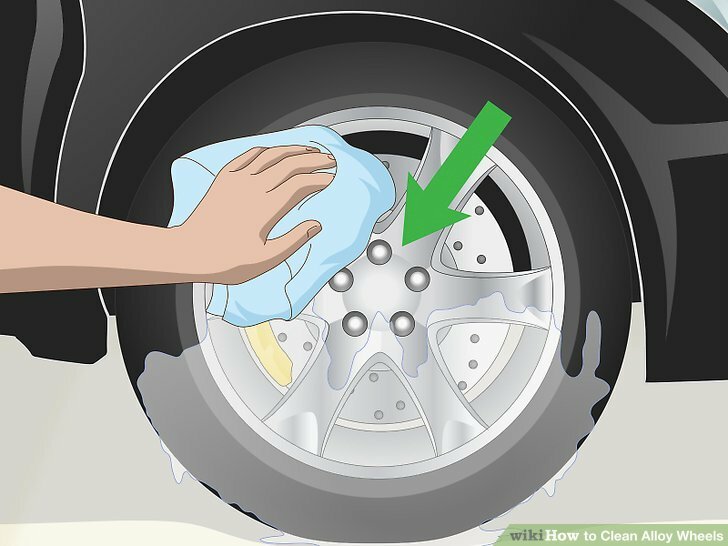 Work in small circles to thoroughly clean the wheel. 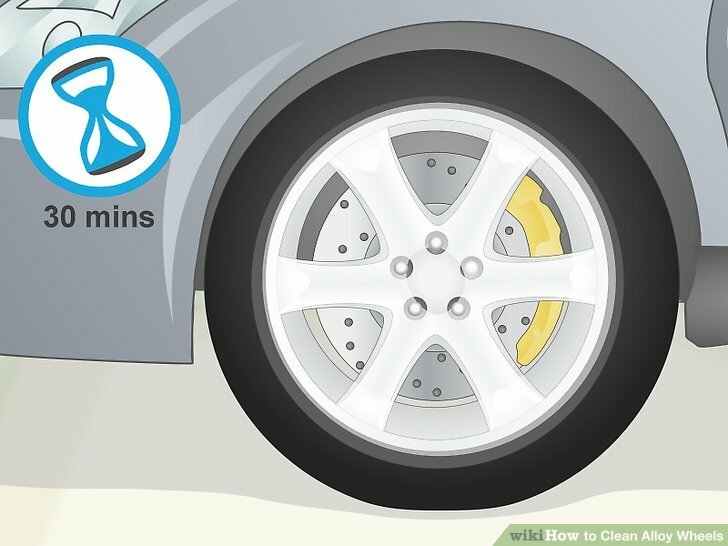 Focus on cleaning in between the spokes of the wheel where dirt tends to build up more. When you notice the brush getting dirty, rinse it in cold water. Car detailing brushes can be purchased at your local automotive store. Use a soft-bristled toothbrush to clean tight areas, like the rim screws or between tight spokes. Rinse the cleaner off the wheel. 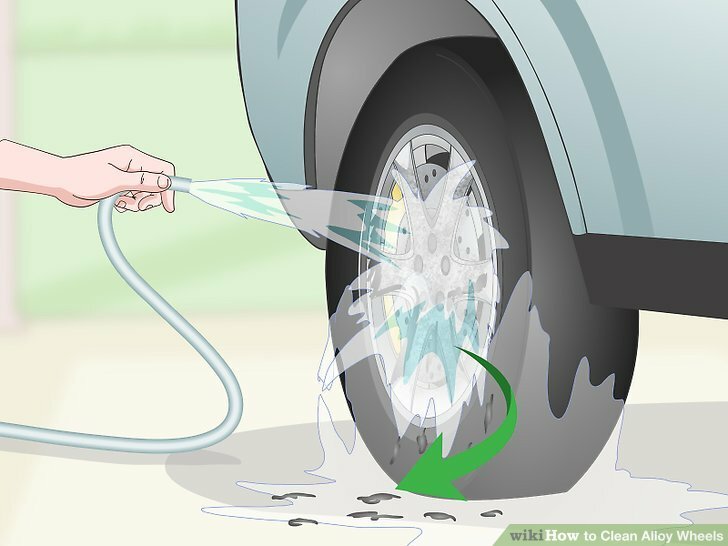 Use a gentle stream from your hose to remove the cleaner from the wheel. 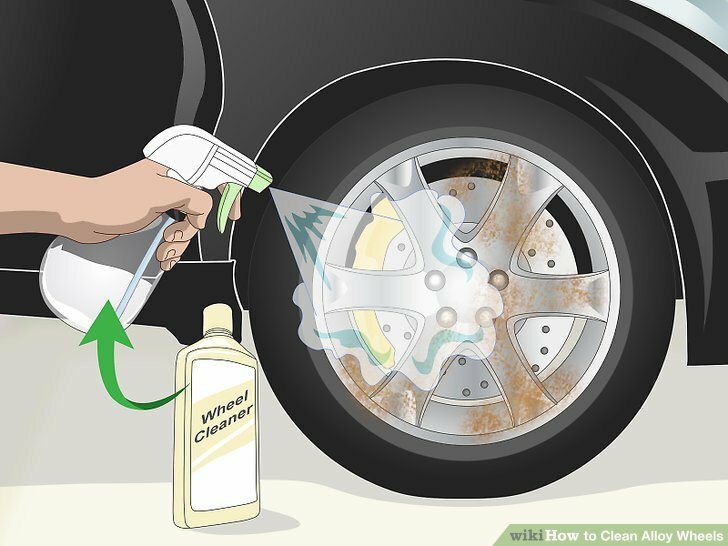 If you leave the cleaner on your wheel, it could leave residue or cause corrosion. Make sure to rinse any area that you may have gotten cleaner on. You do not need an attachment for your hose when you rinse off the wheel. Dry the wheel with a microfiber cloth. Wipe the alloy wheel so there isn’t any standing water. Drying your tires prevents any water spots or corrosion from forming on your clean wheels. Don’t use a coarse rag since it could scratch your wheels. 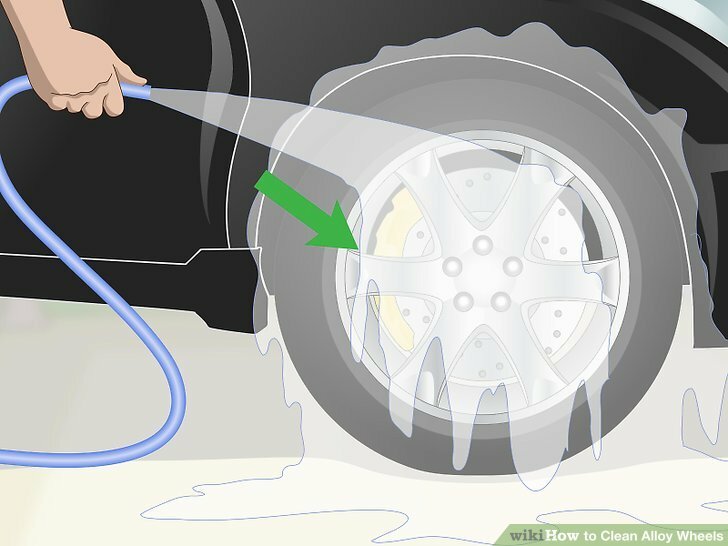 Rinse loose residue of the wheel with your hose. Clean your wheels outdoors when the weather is dry and cloudy. Spray the wheel with your hose using a power washer attachment. Clear away as much dirt and grime as you can just using your hose. Power washer attachments can be purchased at your local lawn care store. Spray an oven and grill cleaner on the metal rims and let it set for 2-3 minutes. Shake the aerosol can before coating the alloy with the cleaner. The cleaner should foam on contact to help penetrate dirt and grime buildup. 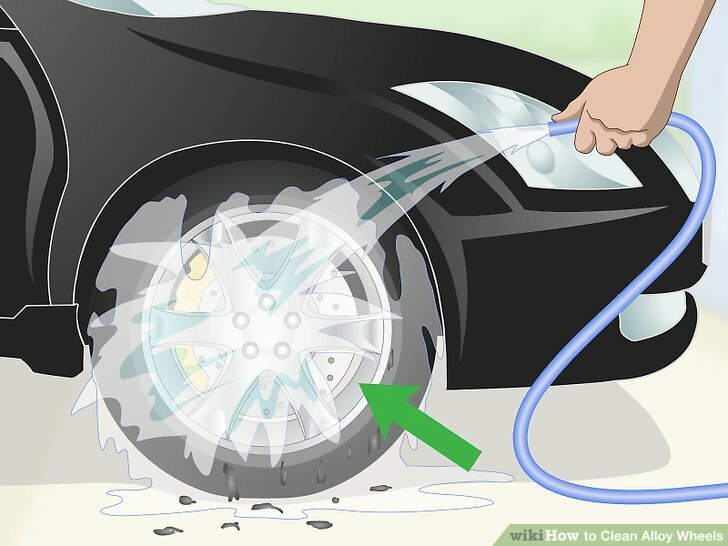 Let the cleaner sit on the surface of the wheel for 2-3 minutes to loosen up the residue. Oven and grill cleaner can be purchased at any homecare or hardware store. Wear safety goggles and gloves while working with an oven and grill cleaner since it may cause irritation. Remove any plastic hub covers to clean underneath them. Use a long-handled brush to clean the wheel barrels. Find a soft-bristled scrub brush from your local automotive store. 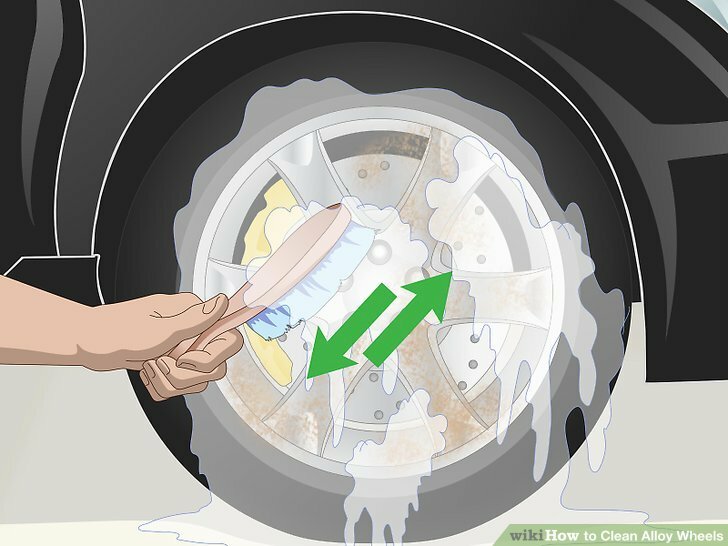 Scrub the inside of the wheel, putting your brush through the spokes if your wheel has them. Work around the wheel completely until the barrel is free of any dirt or residue. For extra cleaning power, put more of the cleaner on the end of your brush. Don’t use a hard-bristle brush or steel wool since they could scratch your tires. Scrub the faces and between any spokes with a smaller detailing brush. Clean the front of the wheel with a soft-bristled detailing brush from an auto car store. Work in tight circles to scrub the dirt away. Focus on the small areas where dirt collects, like the rim screws and where the spokes meet in the middle. A soft-bristled toothbrush will work if you don’t have a detailing brush. Use your hose to remove the cleaner. 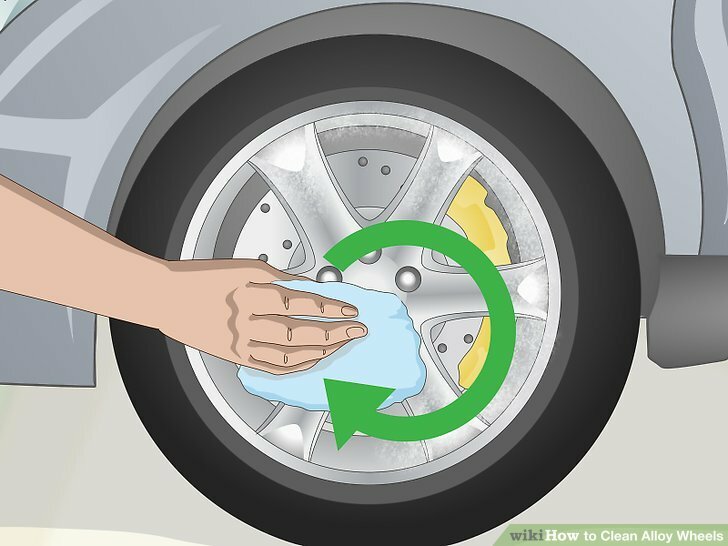 Rinse off the cleaner completely off the wheel so it doesn’t leave any residue. Make sure to clean the foam out from the inside of your wheel as well. You do not need to use the power washer attachment during the final rinse. Dry the rims with a microfiber towel. Use a soft, dry microfiber towel on your wheels. 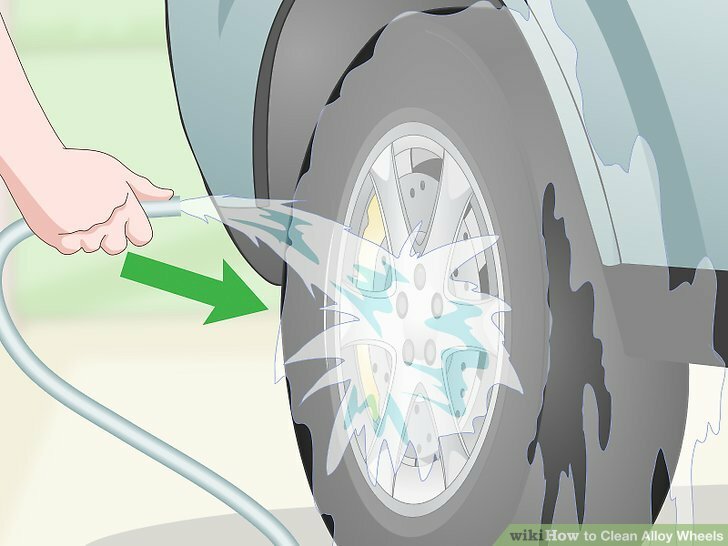 Wipe away any standing water to prevent any water spots from forming on your wheels. Old, coarse rags could scratch your rims if you use them. Buy a sealant made for alloy wheels. Find a small container of sealant or rim wax to use on your wheels. Sealant creates a protective layer to make it harder for dirt and grime to stick to your wheels. Sealant can be found at your local auto care store. Apply a sealant to the metal parts of the wheel using a detailing pad. Work in a well-ventilated area on a cool day. Apply a coin-sized dab of the sealant onto a sponge or detailing pad. 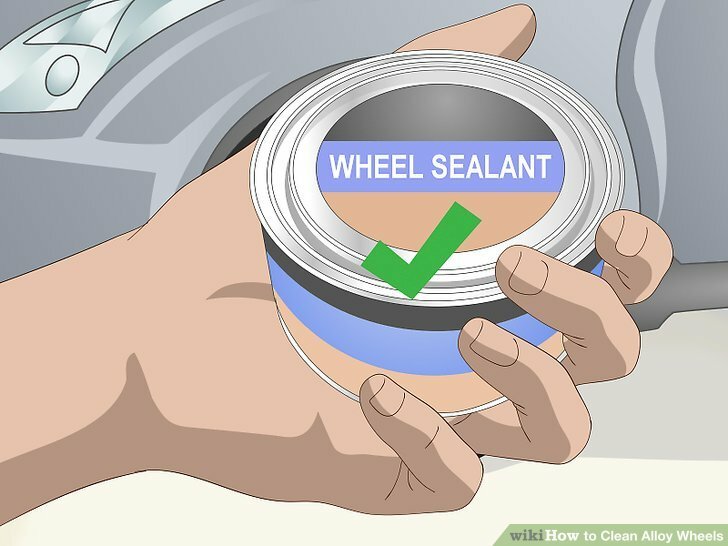 Rub the sealant onto the metal parts of your wheel until it’s clear. Work the sealant into the center hub, the spokes, and the barrel of the wheel. Sealant protects your tires from dirt, brake dust, tar, and any other things on the road that could make them dirty. Let the sealant cure for 30 minutes. Let the sealant absorb into the alloy to form a protective layer. Make sure the area you’re working in is well-ventilated while the sealant dries onto the wheel. Buff the sealant with a microfiber cloth. Rub a dry microfiber cloth over all the areas you applied the sealant to remove it. Work the cloth in small circles until your wheels are shiny and have an even finish. Don’t forget to buff in between the spokes as well. Clean the wheels weekly so dirt and grime doesn’t build up. 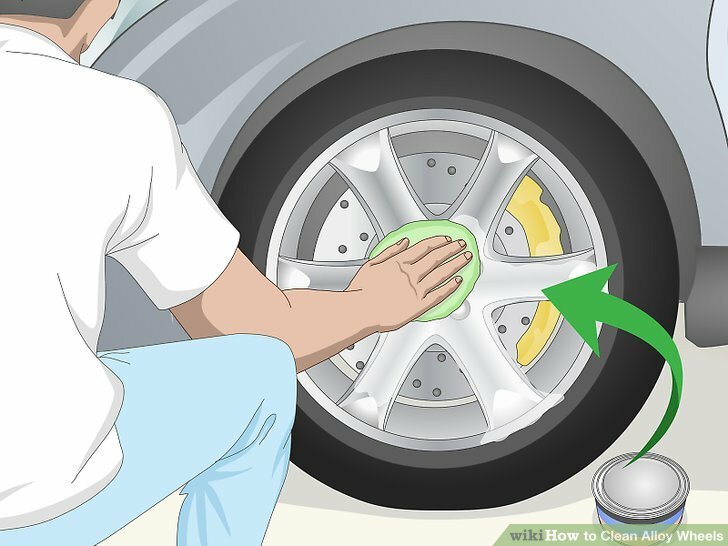 Remove the wheels from your car if you want to clean them the most thoroughly. Don’t use a hard-bristled brush or steel wool while scrubbing your wheels or else you could scratch them.